Red Roof is introducing the Lord & Moris Times Square Hotel as part of its newly launched soft brand, The Red Collection. This marks the third property, second franchised hotel, and first location in New York City, one of the top 5 cities travelers love – and visit – in the U.S. 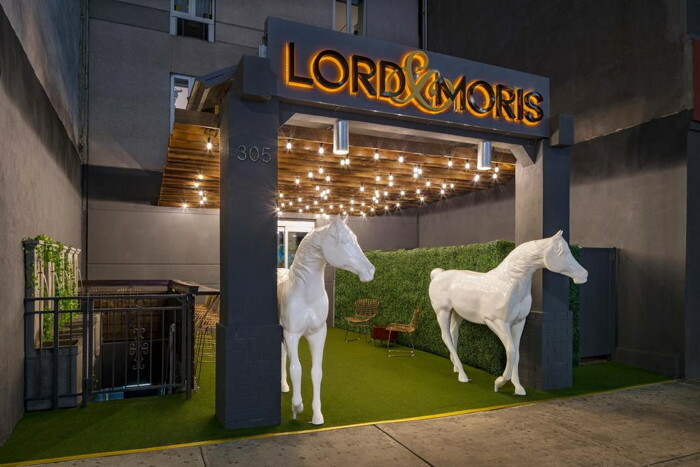 In the center of Times Square, the Lord & Moris Times Square Hotel is managed by REAL Hospitality Group. It’s just a short walk to some of New York’s most famous attractions including the Empire State Building, Broadway theatres, and the Vessel at Hudson Yards. The hotel’s 78 guest rooms are smartly designed spaces, some with bunk beds perfect for friends and families traveling together, providing guests with a quintessential New York experience. The property, accessible to some of the country’s best culture and cuisine, offers unique features, rustic accents and chic wooden design elements. Hotel amenities include custom fountains in the lobby offering free filtered water, reliable Wi-Fi, tablets in each room, flat-screen TVs, stylish bathrooms, and more. Two additional Red Collection properties will open in Brooklyn later this year. As with other Red Collection properties, the hotels will have their own distinct names, local flare and design standards aligned with consumer wants and needs. The Red Collection’s flagship location, The St. Clair Hotel – Magnificent Mile in downtown Chicago, opened in September. State House Inn, the second property and first franchised property in The Red Collection, opened in Illinois’ capital city, Springfield in October. Future growth of the soft brand will continue to focus on locations in major cities, state capitals and resort destinations, providing modern, affordable and authentic experiences for guests.